What You'll Need: scriptures, Pioneer Trek map, GAK 412/GAB 101: Crossing the Plains, GAK 507/GAB 123: Brigham Young, supplies for activities. Scripture: Doctrine & Covenants 136:4 - And this shall be our covenant—that we will walk in all the ordinances of the Lord. This month we have been learning about Pioneer Heroes. Many pioneers were brave and faithful. We hear great stories about their courage and bravery, but Pioneers were regular people just like me and you. Today we are going to learn about life as a Pioneer. When Joseph Smith first saw Heavenly Father and Jesus Christ he was living in New York state. The church was formed there and they lived happily, but soon others wanted Joseph Smith to leave New York. The church was growing and getting more and more new members. Other people didn't understand the Prophet's teachings and were angry at the growing church. The saints just wanted to be safe and happy so they kept moving west. Joseph Smith was living in Illinois when angry people killed him in Carthage Jail. 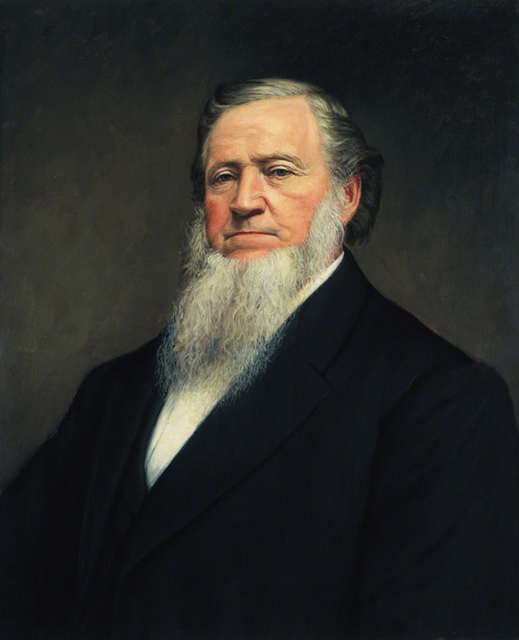 After he died, Brigham Young became the Prophet of the church and got all of the saints ready to move west to a place where they could live and no one would make them leave. The people did not have cars. They had to walk and put all of their belongings in wagons. 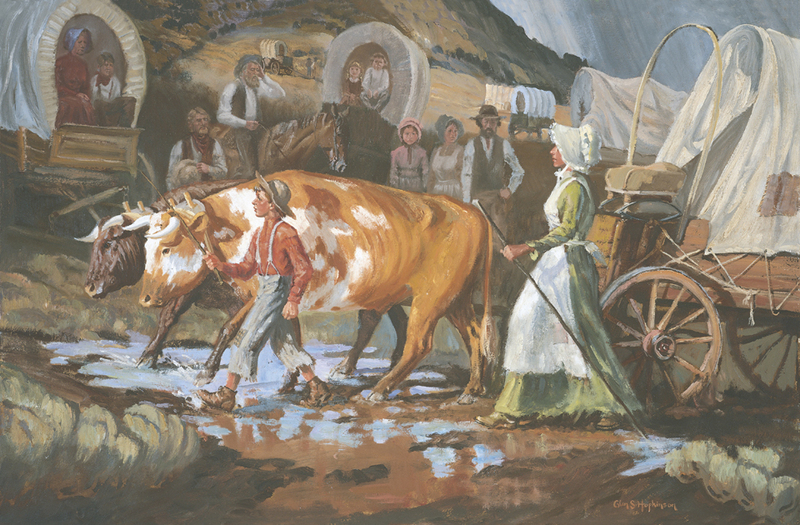 The people who went west with Brigham Young from Illinois to Utah are called Pioneers. 1. A bugle will blow at 5:00 a.m. That's when it is still dark outside! Everyone had to get up, pray, eat breakfast, feed and water the animals, and be ready to start walking by 7:00 a.m.
2. The wagons are to keep together while traveling. 3. Every man must stay by his wagon and keep his gun by his side. 4. At night the wagons are to be drawn into a circle. The bugle will blow at 8:30 p.m. Everyone is to pray and be in bed by 9:00 p.m.
- What kind of daily rules do we have? - Which ones are the same as the pioneers? - Which rules of ours are different? The first pioneers were to prepare the way for the many Saints who would come later. As they traveled, they made roads and prepared bridges and other ways to cross rivers and streams. They also made maps of the trail and recorded information that would be helpful to the next companies of pioneers, such as good places to camp or feed the animals. The pioneers also stayed busy hunting for food, repairing their wagons and equipment, and taking care of their animals. At night the pioneers brought their wagons into a circle, with the openings of the wagons facing out. The horses and oxen were tied inside the circle. Some people had brought musical instruments with them, and the pioneers loved to sing and dance. The pioneers also enjoyed playing games such as checkers and telling humorous stories. On Sundays Brigham Young told the Saints crossing the plains to rest their animals and themselves. No fishing, hunting, or labor of any kind was allowed on Sunday. The pioneers held sacrament meeting, prayed, and studied the scriptures. Sometimes they wrote letters to family members left behind. - What do we do on Sundays? Yesterday (July 24th) was a special holiday in Utah. It's called Pioneer Day because we celebrate Pioneers on that day. Bear your testimony about the bravery of the Pioneers and how we can emulate their strength. Pioneer boys and girls couldn’t afford to buy fancy dolls. Instead, they made their own out of whatever materials were at hand. 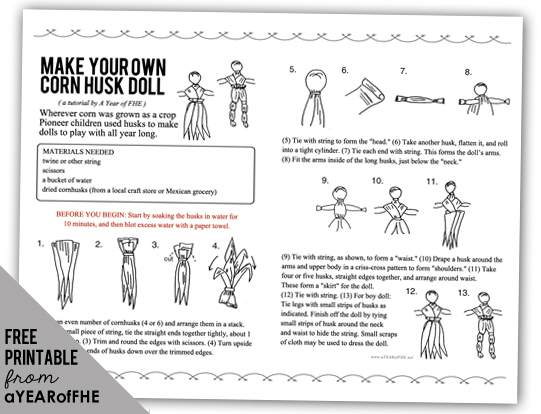 One kind of doll was made out of corn husks. Hey there---love your FHE's by the way. And i want to do this one with my kids right now before church but some of the links aren't working and I don't see the link to print as a PDF. The game link and the map link specifically. Thanks! Got it all fixed except for the map. Still working on that! thank you so much! i love the part about the schedule/rules. i think my kids will like hearing about that part. This is my first time visiting your site. It looks amazing and I am excited to use it as a resource for our FHE. Thank you so much for all your hard work! I think my kids are really going to love it! Thanks for this lesson! It was exactly what I was looking for. Kids had fun. We made homemade ice cream in ziplock baggies to go along with this lesson. Thanks! I just found your site and I am so excited. I used this lesson tonight (with a little of Lesson 29 and personal family history thrown in) and my kids had a great time. It took a little lo9nger than expected because the older kids had so9 many questions. It was great! Thank you! I plan to use this lesson tonight. Thanks for all your hard work that you are so willing to share! I love this site. i luv your site! i used the pioneer trek map for my pioneer assignment!!! This lesson said "file has been deleted". LOVE YOUR LESSONS! Thank you for all you do!!!!!!!!! Thank You! My husbands parents are serving a mission in Missouri and we are going to see them this summer. So, we want to give our small children as much as we can in preparation for our trip so they can appreciate the pioneer sights we get to see while we are there! Thanks for all of your hard work! Thank you for this! 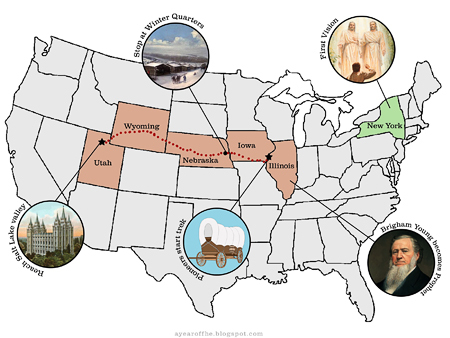 We've just moved to Missouri and will be taking our first trip to Nauvoo at the end of this month, so we wanted to give the kids a little background of church history to prepare. This is so perfect! I love everything about this lesson! 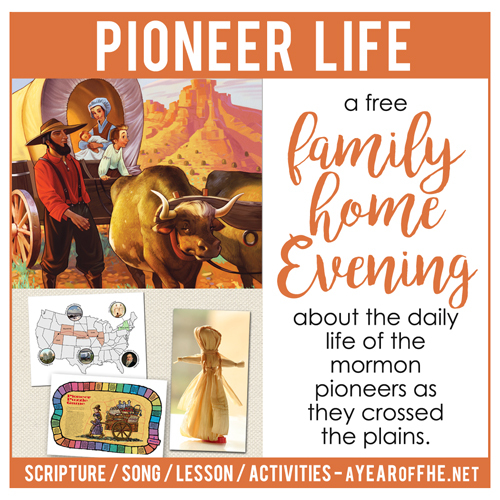 It will be so great for my kids tonight, as it being the week of Pioneer day here in Utah, the lesson is just what I was looking for for FHE tonight. 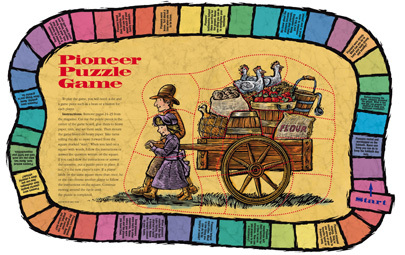 Going to use some of these ideas with my kids for Pioneer Day. Thanks for putting this together! Thank you! This site is just what I needed to be consistent!